story by allison bart | photos by will darwallI never thought I would voluntarily shorten my summer vacation. Sure, I was excited to start my freshman year at Penn, but my plan was to enjoy a long, leisurely vacation in Maine. 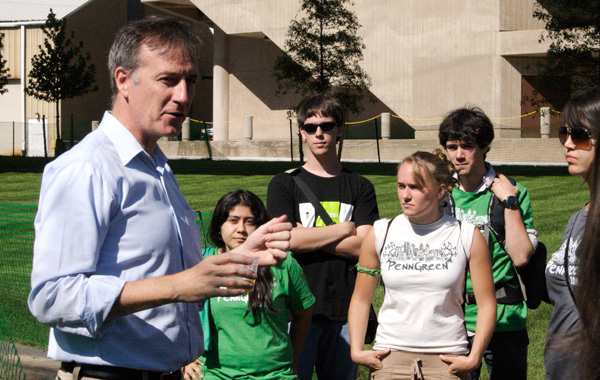 But at the beginning of the summer, while browsing my new school’s website, a pre-orientation program caught my eye: PennGreen. The five-day program promised to immerse new students in the many local green opportunities that both Philadelphia and Penn offer. A requirement for the program was a brief essay, and I wrote an ode to the Brussels sprout: “The smell of feet fills up other peoples’ kitchens when you are cooked, but all I smell is your sultry leaves covered in garlic and olive oil, slowly caramelizing.” Happily, I made the cut. Having grown up a short drive from campus, and having spent a spring term interning at GRID, I felt like I might have a pretty good handle on what Philadelphia offers regarding sustainability. Even so, it was truly amazing to crisscross the city and beyond to witness what a rich sustainability scene we have. Though Mother Nature was not feeling too friendly when we arrived (thanks, Hurricane Irene), we were able to take a walk to Clark Park for games and to learn about local farmers markets. The following day, Dan Garofalo, Penn’s environmental sustainability director, spoke to us about the university’s recycling initiatives, outlining Penn’s hopes to reach a 40 percent recycling rate on campus. Next, we ate dinner at Rx, a restaurant focused on quality locally-sourced food. Day two began with a tour of the Wilmington Organic Recycling Center, a truly remarkable composting facility, followed by lunch at Morris Arboretum and a get-to-know-the-place scavenger hunt. Later that day, I was lucky enough to participate in a lecture and Q&A with Sarah Wu, the policy and outreach manager for the Mayor’s Office of Sustainability. Wu explained the city’s initiatives through the five Es: energy, environment, equity, economy and engagement. The day ended with a ride on SEPTA to the Reading Terminal Market, where we picked up ingredients for a dinner made at our leaders’ houses. Though I have been to Reading Terminal on countless occasions—especially during my internship at GRID—seeing some of my classmates experience it for the first time filled me with Philly pride. The next day, we were taken on a private tour of the recently opened Penn Park, which just last year was a vacant lot. From there, the PennGreeners took a bus out to Phoenixville, Pa. to meet the dynamic Liz Anderson of Charlestown Farm, and heard about some of the challenges of organic farming. After an afternoon of farm work and delicious homemade pizza, we prepared for a night of camping at Gifford Pinchot State Park. The following morning, we took a bus ride to the Susquehanna River, where we embarked on canoes for an ecological river tour. Of all of the experiences with PennGreen, this one resonated with me the most, as we were able both to witness the effects of human activity on the environment and have a day of canoeing with our many new friends. After completing the tour, which involved some highly competitive canoe races, we got on the bus and prepared for the beginning of another set of introductions to Penn, the new student orientation. So, was it worth clipping my summer vacation by a few days? Though we did a fair amount of traveling, the five days were more exhilarating than exhausting. And I completely recommend seeing as many of these places for yourself as you can. Perhaps just as important as seeing sustainability in action is the community the program fostered. I will always remember the conversations I had with my classmates and leaders. And isn’t community what sustainability is all about?